Enjoy a fresh-tasting sip of water on the go with this filter water bottle. The BPA-free plastic bottle helps reduce lead, chlorine and more from up to 22 oz. of tap water and even includes a convenient carrying loop to let you take your bottle wherever you roam. Simply refreshing. For best results, change filter every 3 months. 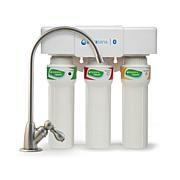 Do not use with water that is microbiologically unsafe or of unknown water quality without adequate disinfection before or after filtering. Attach filter cartridge to lid. Press firmly into position. Fill bottle with cold water. Leave approx. 1-1/2" of space from water to top of bottle. 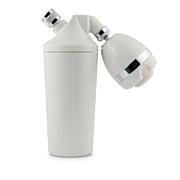 Requires gentle suction to draw water through filter Screw lid tightly onto the bottle. Volume Capacity: Approx. 22 oz. Pretty design, and so functional. 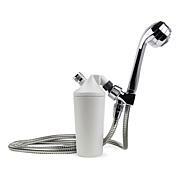 Purchased this for my husband & he was quite impressed with the quality of the water & the added filter was another plus. The size of this bottle is great and fits in the palm & with that grip design makes it nice for it not slipping out of ones hand. Very handy for outtings & everyday usage of ones needs. 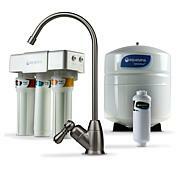 A must for Clean drinking water. Thank you Aquasana!